How many people get foot drop? What can I do if I have foot drop? How is foot drop treated? Foot drop, or dropped foot, is a symptom of multiple sclerosis caused by weakness in the ankle or disruption in the nerve pathway between the legs and the brain. This disruption means it is difficult to lift the front of the foot to the correct angle during walking. As a result, the foot hangs down and may catch or drag along the ground and can cause trips and falls. Foot drop can be successfully managed with some lifestyle modifications and treatments. Functional electrical stimulation (FES) uses small electrical charges to stimulate the foot into a more natural position for walking, or an ankle support (orthotic) can be used to hold the foot in a rigid position. If you are experiencing foot drop, your foot may hang down, drag or catch on the ground when you are walking. This can make it more difficult to manage stairs, curbs and uneven surfaces, and make you more vulnerable to tripping and falling. To compensate you might alter the way you walk to make sure you clear any obstacles. Most commonly this is done by lifting your leg higher, as if you were always climbing stairs, but this way of walking requires more effort and uses more energy. Your legs may tire quickly and you might feel wobbly. In time, this can lead to further problems such as pain in the hips or lower back, a tightening of muscles and poor balance. In MS, foot drop is caused by weakness in the ankle or disruption in the nerve pathway to and from the brain, rather than in the nerves within the leg muscles. This results in poor coordination in the leg and ankle affecting the way you walk. If the coordination between the nerve messages and leg and ankle muscles is out of sync, the foot cannot be lifted to the correct angle at the right point when taking a step, so that the toes drag or catch along the floor or you slap your foot down. Other MS symptoms can make foot drop worse. Numbness or other altered sensations in your feet may make it difficult to feel the floor. Muscle weakness or spasms in the leg muscles can make it more difficult to control your leg and a dropped foot. Although foot drop is a commonly recognised symptom of MS, there are no statistics available to estimate how many people with MS are affected by it. If you are having trouble lifting the front part of your foot off the ground while walking you may have foot drop. It may make you self-conscious and might tire you out. 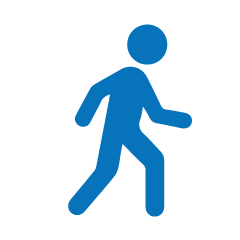 If you are concerned about your walking, contact your MS nurse or neurologist, or ask your GP for a referral so you can be assessed. Foot drop can be managed successfully through treatments and some lifestyle modifications, but it might take some time to find what works best for you. A physiotherapist can advise on exercises to strengthen the foot and ankle muscles. They can also help treat any other symptoms that may be making your foot drop worse such as spasms or complications that may have arisen as a result, such as altered ways of walking (gait). As well as exercises they may provide equipment that can help correct the foot position, including functional electrical stimulation which is described in more detail below. An ankle-foot orthosis (AFO), also known as a splint or brace, is a device usually made of plastic or carbon fibre that is worn on the lower leg. It holds the foot and ankle in the correct position during walking and fits close to the leg so it can be hidden under socks and trousers. If your health professional thinks one might be appropriate they can refer you to an orthotist, who is a specialist in measuring and prescribing orthoses. FES is a treatment that applies small electrical impulses directly to the nerves in the affected muscles to stimulate movement of your foot while walking. The device is worn on the leg or around the waist and is activated by a sensor worn in the shoe. An assessment by a physiotherapist trained in the use of FES is required to find out if the treatment will be suitable for you. How can I manage foot drop myself? There are some options you can try to help you reduce the risks of trips or falls if you have foot drop, which you can use in conjunction with one of the treatments. avoid cumbersome or heavy shoes that quickly tire your muscles. plan your movement, consider which route offers the least potential risk or fewest obstacles. If an obstacle does exist, can this be either safely moved or negotiated? with electrical items, try to keep wires and cables covered or taped down in walking areas to prevent them being tripped over. An extension lead can help to reroute cables away from places where they might be a tripping hazard. You can read more about how to reduce falls in Falls: managing the ups and downs of MS. Walking difficulties may be one of the first symptoms to be noticed in MS but these difficulties are common to a number of medical conditions. FES is a treatment used in MS, particularly as a treatment for foot drop.